Oregon Swiss Food Sdn. Bhd. 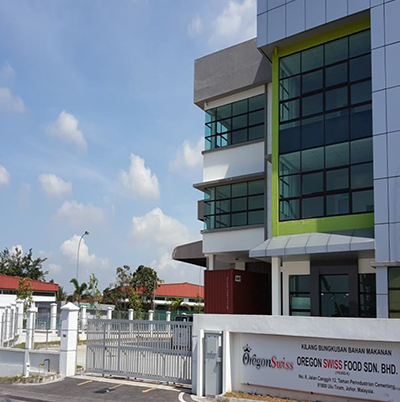 is an established food ingredients manufacturing company in Malaysia. With over 20 years of business experiences and product knowledges in Cocoa Powder & Chocolate, we are well positioned and confident to furnish you the best products in the food industry. We focus in researching and developing new products consistantly, to fulfill market needs and customer's requirements. Apart from manufacturing and distributing our own brands of products, we also provide custom blending and repacking services as an alternative for traders and network marketing organizations. We are committed to the highest food production standards through the Quality Standard Management which complied to the global food industry certification requirements sush as ISO22000, HACCP and HALAL. Our products range from Alkalized Cocoa Powder, the Dry or Powder-based food & beverage products, the Granular-based nuts & grains products, and also the Chocolate specialty products. Providing reliable services and quality products cater for local and also overseas markets. Building good relationships and working hand-in-hand with our valued customers and suppliers.